Overall, over two-thirds of carers had had contact with at least one type of service in the past six months, with counselling/psychologist services, carer support staff from a government child protection department and respite care services being most common. Relative/kinship carers were less likely than foster carers to report contact with most services. Carers tended to have positive views of the services they had used, especially transport services and respite care services. The data suggest various service needs that had not been met for carers, with needs for carer support staff from the government child protection department, child counselling/psychologist services and carer support organisations and groups, and respite care services being most prominent. Significant numbers of carers reported having difficulties in receiving the professional support they needed (nearly four in ten of all carers). Long waiting lists/support staff availability was most commonly reported as reasons for feeling this way. Carers were initially asked about whether they had ever used various types of services while a child was in their care as part of an out-of-home-care placement. For the services that carers reported using in the past, they were then asked whether they had used the service in the past six months (or for study children who were no longer in the household, whether they were used in the last six months the child was present in the household). The most common types of services that carers had contacted with in the past six months were child counselling/psychologist services (33%), carer support staff from a government child protection department (25%) and respite care services (20%). Overall, over two-thirds of carers had contacted at least one type of service in the past six months. There were large discrepancies between foster and relative/kinship carers in their level of service usage, with foster carers tending to report higher contact with most services than relative/kinship carers. Notes: Percentages are based on weighted data and small numbers of respondents' "Don't know" answers were included in calculating percentages (0.01%-1% of all carers across the items listed). Sample sizes are unweighted. aOnly asked of study children earlier identified as being of Aboriginal and/or Torres Strait Islander origin. The services that were most commonly identified as being "very helpful" were transport services and respite care services (68-69%). This could potentially be due to carers receiving an immediate benefit from these services, for example getting to where they need to with transport services or receiving some much-needed/appreciated temporary respite from their caring role. Carers' views on the helpfulness of the services received were relatively similar between foster and relative/kinship carers, despite the lower likelihood of relative/kinship carers using most types of services. Notes: Percentages are based on weighted data. Unweighted sample sizes range from 131 to 750. a Only asked of study children earlier identified as being of Aboriginal and/or Torres Strait Islander origin. Analysis was conducted to identify carers' "unmet service needs"; these were defined as instances where carers reported they currently needed a service (or in the last six months the study child lived with them), but had not received it in the last six months or ever (Figure 2). 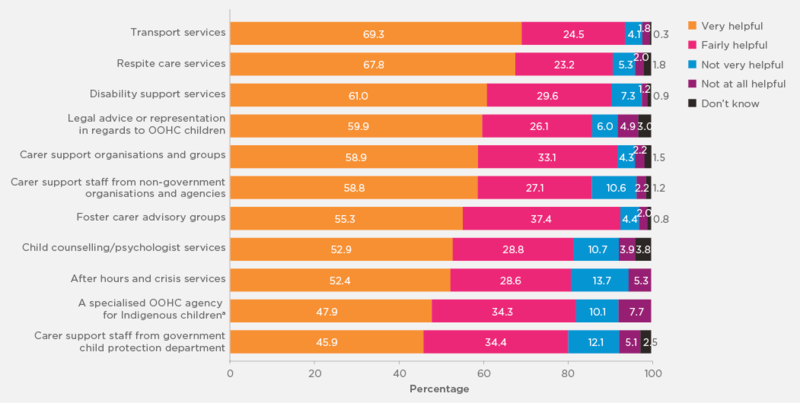 The most common "unmet service need", which applied to one-quarter of carers, was carer support staff from the government child protection department (25%), followed by child counselling/psychologist services and carer support organisations and groups (both at 22%), and respite care services (19%). Overall, nearly two-thirds of carers had one type of service need that had not been met. Foster carers were more likely than relative/kinship carers to indicate an unmet need for a number of services, including foster care advisory groups, after-hours and crisis services, and disability support services. Notes: Percentages are based on weighted data. aOnly asked of study children earlier identified as being of Aboriginal and/or Torres Strait Islander origin. Carers who reported having required one or more types of services (including those currently used) were asked about whether they had any difficulty in getting the professional service/support they needed. Just under half (47%) of carers who reported having a current need for services said they had some difficulty in receiving the required support (equivalent to 37% of all carers), with results similar between foster and relative/kinship carers. Overall, by far the most common barrier to receiving services identified by carers was long waiting lists/support staff availability (at 46%). Not being aware of what was available (27%), no appropriate services (22%), the service cost (21%) and agency problems (e.g., bureaucracy, poor communication) were the other most commonly identified barriers. There were relatively few differences between foster and relative/kinship carers in regards to factors that made it difficult to receive the services they needed but a slightly higher proportion of relative/kinship carers than foster carers identified not being aware of what was available as a factor. Notes: Percentages are based on weighted data. The sum of responses may exceed 100.0% due to multiple responses. a Responses were recorded based on carers' verbatim responses. b Only includes carers who said that they had difficulties accessing services.